This Saturday I will attack my greatest challenge yet, Tarheel Ultra. This is a 367ish mile self-supported foot race down the cost of North Carolina with exactly 192 hours to do it in. 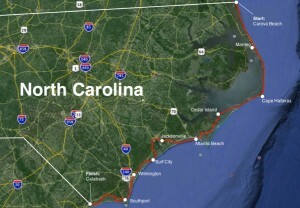 We start on the beach at the NC/Va State line and will stop at the NC/SC state line in Calabash, NC. Any phone calls, text or message of encouragement & company are welcome. If you do not have my number and want it, send me a private message. I will do my best to keep some sort of social media updated. You can follow me on Twitter, IG, FB & my blog. One of this links below Is my Spot satellite Tracker which should report my progress every 5 min and will be active after 8:AM Saturday Morning. Finally the TU website will be updated periodically with everyone’s progress.